Don’t you wish your kids could wrap their heads around Captain Jack’s wise words and understand that they actually do possess the power to improve the outcome of whatever it is that’s challenging them? It’s really just a matter of perspective. Easier said than done, believe me, I know! It’s MUCH easier for me to help other people’s children with perspective than it is to help my own. After all, to my kids, I’m just Mom. What do I know? All they hear is “you have a bad attitude.” Mind you, that’s not at all the message I’m trying to send, but it is the message they hear, loud and clear. 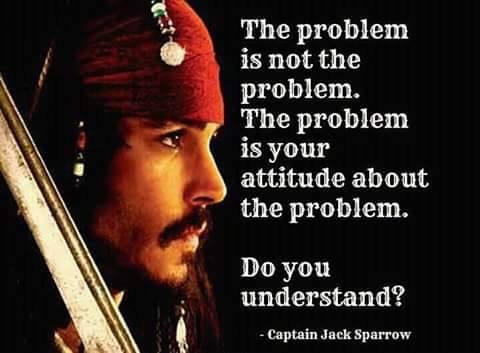 A communication tip for you: When relaying Captain Jack Sparrow’s wise words, do not use the word attitude. The desperate helpful message you’re trying to send will NOT be received. Unfortunately for me, my own kids can sometimes see right through my carefully crafted word choices. They know I work with kids for living, so they’re often super skeptical of my angles, but that’s my problem, not yours! Lucky for me, working with other peoples’ kids is much easier! Often, I’m telling kids the very same things their parents have been telling them for what seems like forever. Coming from me though, it’s sounds…different…better…doable. It sounds that way mostly because, I’m not mom. One of my favorite tools/strategies is to to help kids understand the power of perspective. I don’t sugar coat it and tell them it’s easy to look at the glass as half full, or that they have to just look for the silver lining and they’ll find it. Kids feel frustrated when life is hard and they can’t find any good in a difficult situation. I help them accept that It’s not always easy and it almost always takes mindful intention to see things in a new light, but in the end, there are benefits for them. Kids need to know “What’s in it for me?” It’s natural and developmentally appropriate for kids to want to know. You’d be surprised at how motivating it can be for a kid when she realizes this is something she can actually control. Because, let’s be honest, kids don’t have control over much, do they? She will feel empowered and ready to start making some positive attitude perspective changes. So first, when talking to your kids about their attitude, don’t use the word attitude! The minute that word comes out of your mouth, you’ll lose them. Second, be honest with them about the fact that it is hard work. They need to know it’s okay if it takes some time to shift their perspective. And third, help them figure out what’s in it for them. It’s a lot easier when your kid is “on board” about their “attitude.” Finally, if those things don’t work, call me because, well…I’m not mom.